Home/Blog, personal, wahmlife/These are a few of my favorite [office] things! These are a few of my favorite [office] things! You’ve seen my blog about my favorite embroidery supplies from Amazon, now let’s do a review of my favorite office supplies that I order using my Prime membership. 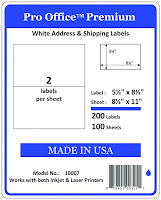 If you’re selling your embroidery online, there are items you can’t be caught without, including tape, polymailers, printer ink, and shipping labels! All of these things I purchase from Amazon. First I start with my printer and the ink that I use. 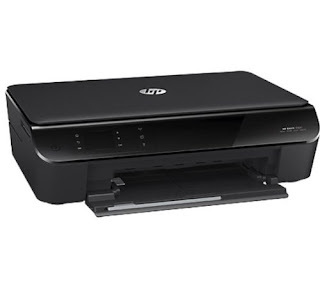 You know there are hundreds of choices out there for printers for your office office, and each uses its own ink. I will share with you what I use: the HP Envy 4502. This printer was affordable, and it does everything I need it to do in my small office. Next up, if you’re mailing items to customers, are polymailers and printer labels. I know some people swear they save money with printer paper and taping address labels to bags, but in my opinion it comes out about even from the tape, paper, not to mention my time and hassle to tape each label on a bag (and it doesn’t look very professional in my opinion, either). I keep two sizes of polymailers in stock: 9×12 and 12×15. You should choose the size(s) that work best for what you’re selling. Larger boxes I get from the USPS for FREE using my free account on their website at www.USPS.com. Look under Mail & Ship > Order Stamps & Supplies. You’ll definitely need packing tape for sealing these boxes; I keep my same handheld tape dispenser and order refill packs . There are a lot of options on Amazon at comparable prices to your local office supply store or bulk shopping store! 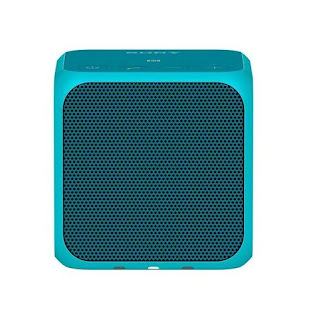 Laugh if you must, but one thing I cannot live without, when I’m out or traveling with just my phone or laptop to listen to music or a show on Hulu, is my Sony SRSX11 portable speaker. For one thing, it’s adorable. I have the teal one, but it comes in black, pink, red, and white as well. Don’t let the price scare you; it’s fairly expensive because it’s a great little cube! I paid more than the Amazon price because I purchased it at Best Buy using a gift card I’d received. I tested out their whole aisle of portable Bluetooth speakers and I am thrilled that this was the one I chose. There were cheaper and much more expensive; this was the best one at the mid-range, in my opinion. Ready for something super-useful and easy on the wallet? Prepare to meet HUBMAN! 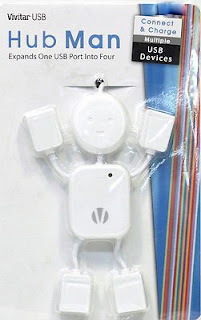 Hubman is a little person-shaped USB extender device that plugs into one USB port on the computer of your choice and provides FOUR USB ports for your use, one from each of his limbs. He’s cute, he’s functional, and he’s around $10 on Amazon. I will advise you – check out the reviews on the Hubman you purchase, and do not purchase solely based on cost. Reviews on the super-cheap Hubman products are terrible. It’s not worth saving four or five bucks to get a product that breaks in three days and costs $5 to return to the seller. Spend a few extra bucks and get a name-brand product. I hope you buy and enjoy something from this list for your office space! Do you have something interesting to add? Comment below!